Wondering about life after FASoS? Career Orientation Day is just around the corner, so don’t forget to register (you may attend up to 3 workshops). It takes place on Saturday 13 April between 10.00 – 17.00 at FASoS. During this event you will be able to talk to people with a career you already have in mind for yourself, or get surprised and inspired by others you would have never thought of. This day will give you an insight in the many different career paths we as humanities and social scientists can take. 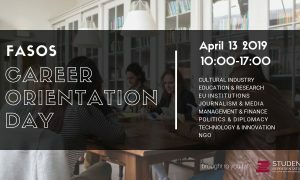 Are you interested in working in the cultural sector or journalism? In Brussels for an EU institution? Or for a non-governmental organisation, or a career in academia starting with a PhD?